Astronomers have made the first radio-telescope images of a powerful coronal mass ejection on the Sun, giving them a long-sought glimpse of hitherto unseen aspects of these potentially dangerous events. "These observations are going to provide us with a new and unique tool for deciphering the mechanisms of coronal mass ejections and how they are related to other solar events," said Tim Bastian, an astronomer at the National Science Foundation's National Radio Astronomy Observatory (NRAO) in Charlottesville, Virginia. 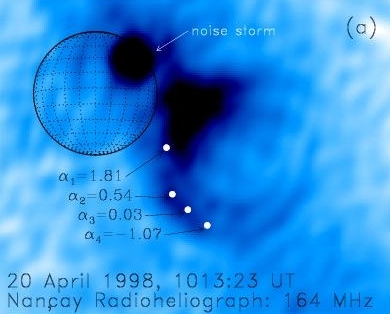 Bastian, along with Monique Pick, Alain Kerdraon and Dalmiro Maia of the Paris Observatory, and Angelos Vourlidas of the Naval Research Laboratory in Washington, D.C., used a solar radio telescope in Nancay, France, to study a coronal mass ejection that occurred on April 20, 1998. Their results will be published in the September 1 edition of the Astrophysical Journal Letters. Coronal mass ejections are powerful magnetic explosions in the Sun's corona, or outer atmosphere, that can blast billions of tons of charged particles into interplanetary space at tremendous speeds. If the ejection is aimed in the direction of Earth, the speeding particles interact with our planet's magnetic field to cause auroral displays, radio-communication blackouts, and potentially damage satellites and electric-power systems. "Coronal mass ejections have been observed for many years, but only with visible-light telescopes, usually in space. While previous radio observations have provided us with powerful diagnostics of mass ejections and associated phenomena in the corona, this is the first time that one has been directly imaged in wavelengths other than visible light," Bastian said. "These new data from the radio observations give us important clues about how these very energetic events work," he added. The radio images show an expanding set of loops similar to the loops seen at visible wavelengths. The radio loops, astronomers believe, indicate regions where electrons are being accelerated to nearly the speed of light at about the time the ejection process is getting started. The same ejection observed by the radio telescope also was observed by orbiting solar telescopes. Depending on what later radio observations show, the solar studies may reveal new insights into the physics of other astronomical phenomena. For example, shocks in the corona and the interplanetary medium accelerate electrons and ions, a process believed to occur in supernova remnants - the expanding debris from stellar explosions. The electrons also may be accelerated by processes associated with magnetic reconnection, a process that occurs in the Earth's magnetosphere. "The Sun is an excellent physics laboratory, and what it teaches us can then help us understand other astrophysical phenomena in the universe," Bastian said. The radio detection of a coronal mass ejection also means that warning of the potentially dangerous effects of these events could come from ground-based radio telescopes, rather than more-expensive orbiting observatories. "With solar radio telescopes strategically placed at three or four locations around the world, coronal mass ejections could be detected 24 hours a day to provide advance warning," Bastian said. The Nancay station for radio astronomy is a facility of the Paris Observatory. The Nancay Radioheliograph is funded by the French Ministry of Education, the Centre National de la Recherche Scientifique, and by the Region Centre. This research has also been supported by the Centre National d'Etudes Spatiales.